The result is the reduction of aches and pains, a therapeutic soothing sensation and an increase in the rate of healing of damaged muscle and tissue. Using the Gel as a massage therapy results in a deep, long lasting pain relief period and acceleration of the basic healing process through relaxation of stiff, aching muscles, (lasts up to six hours). Users receive pain relief within minutes and after two or three applications Biofreeze's maximum benefits can be felt. BIOFREEZE Cool Gel & Roll-on is ideal for the relief of muscle aches and joint discomfort associated typically with minor backache, tendonitis muscle over-use, strains/stress and sports injuries; Biofreeze can also help to relieve pain caused by Arthritis and Neuropathy. If you suffer from any of these, then BIOFREEZE is for you. Simply apply to the sore spot. After 2 - 3 applications, maximum benefit will be felt. BIOFREEZE Cool Gel & Roll-on is ideal for the relief of muscle aches. pains and joint discomfort and pain typically associated with minor back, neck, shoulder ache, tendonitis, muscle over-use, strains/stress and sports injuries. BIOFREEZE is greaseless and stainless with a vanishing scent. Use it any time, anywhere. BIOFREEZE the Pain reliever that works, which explains why the following professional health practitioners and organisations recommend and use it. Dr Michael A Miller: Chiropractor to the New England Patriots Football Club. Use the ball applicator (Roll-On) to lightly massage Biofreeze to all sides of sore muscles. For joint pain, fully coat the area. When flexibility is decreased due to injury or arthritis, massage in and around the joint and continue flexibility exercises. Biofreeze is particularly effective in lessening arthritis, bursitis, and tendentious pain. Lightly massage the back of the neck to soothe headaches due to tension or stress. Finally, BIOFREEZE CRYOSPRAY Spray is so effective and advanced, you can offer it to your patients with confidence for convenient at home self-care the new Biofreeze Pain Relieving spray compliments the Biofreeze Gel & Roll-on while delivering a formulation that is the perfect blend of science & nature. Using 100% Natural Menthol & 100% Natural Essential Oils & Natural Extracts the Biofreeze CRYOSPRAY relieves the pain without the burn of other sprays. Using Arnica & White Tea Extracts the New spray provides the strongest pain relief without a prescription and is easy to apply, sprays at any angle and penetrates immediately for deep pain relief. The spray application is the newest way to create a no touch method of application for Biofreeze. Even though Biofreeze through any of the other application methods (Gel or Roll-On) is beneficial for acute pain, the spray is particularly beneficial for acute conditions involving severe muscle spasms of the lower back or acute spasms of the upper back or neck. Biofreeze Spray can be applied pre-treatment to acute areas of muscle spasms to allow for a faster relaxation of muscle involvement and better treatment response. For use in treatment rooms or home use. BIOFREEZE spray contains a herbal extracts is used around the world in various health and wellness formulations. The result is a fast-acting, deep penetrating, long lasting pain reliever. BIOFREEZE can effectively help relieve pain from sore muscles, muscle sprains, back, shoulder, neck pain, arthritis, painful ankle, knee, hip and elbow joints, and muscular strains and can be used to relieve pain prior to ultrasound treatments, massage therapy, soft tissue trigger point therapy, rehabilitation exercises and pre and post workout stretching. Benefits of Biofreeze - "CRYOSPRAY"
BIOFREEZE starts to work in just 3 minutes, providing deep penetrating pain relief for up to 8 hours, meaning it only needs to be applied three or four times daily. BIOFREEZE is greaseless, odourless and non-staining, and because the product works simply by cooling the affected areas it can be used in conjunction with any oral medication. Biofreeze Pain Relieving Gel dispensed from a tube affords the opportunity to create a more thorough experience by massaging the affected area during application. This hands-on application also reinforces touch which has been shown to be very important in the healing cycle. 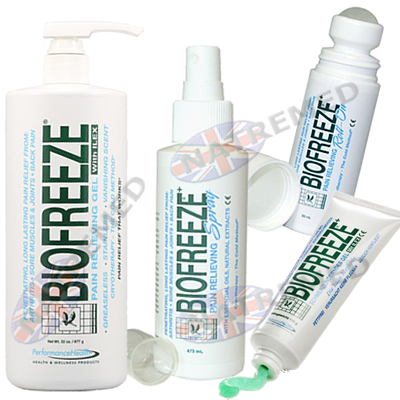 BIOFREEZE maximizes Cryotherapy (Cold Therapy) which has long been acknowledged by the medical community.